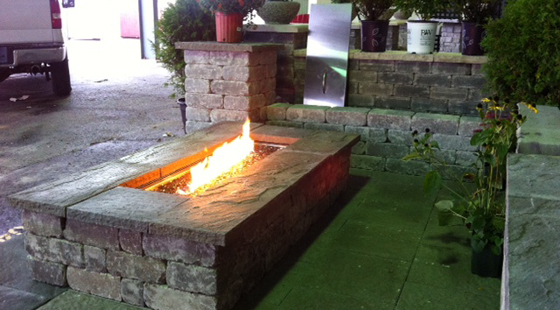 Outdoor Fireplace Kits is the easy way to build that backyard oasis! 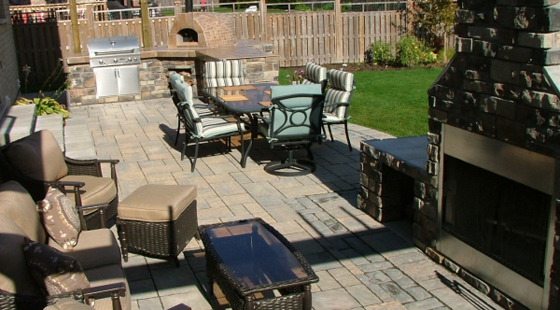 Featuring our unique backyard fireplaces, which makes it easy for the DIYer's looking to create a unique environment in the comforts of their own backyard. 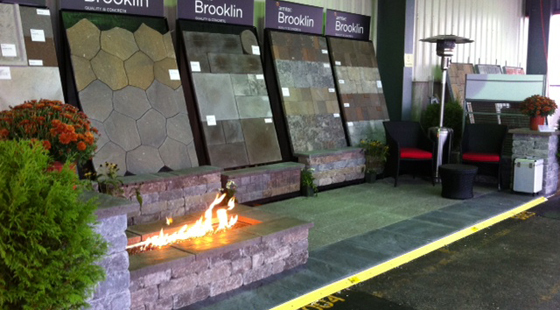 More New Outdoor Fireplace Kits to Come! The Calore2G Series fireplace kits provide both homeowners and professional builders with an easy-to-install alternative to a traditional site-built fireplace. The Calore2G fireplace kits are lined with firebrick to provide an authentic, hand-made look, at a fraction of the cost and time. Unlike a metal fireplace lined with imitation brick panels, the Calore2G uses real firebricks and will never rust and wear out. SS unit includes electronic ignition gas valve and built-in GFI electrical circuit breaker, 2 on/off switches, one for optional light kit, gas shut off, exclusive Torch burner with decorative glass embers, heat resistant glass and black porcelain reflective panel. 6,000 BTU's. 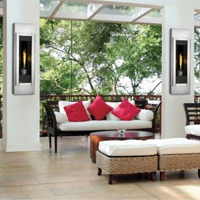 SS decorative door with ceramic glass, exclusive PHAZER® glowing log set and glowing embers with SS burner assembly, millivolt remote control valve and built-in adjustable flame/heat control, piezo ignitor and SS cover, up to 40,000 BTU's. Unit comes in natural gas, propane conversion kit available. SS decorative door with ceramic glass, exclusive PHAZER® glowing log set and glowing embers with SS burner assembly, millivolt remote control valve and built-in adjustable flame/heat control, piezo ignitor and cast iron andrirons., up to 65,000 BTU's. Unit comes in natural gas, propane conversion kit available. 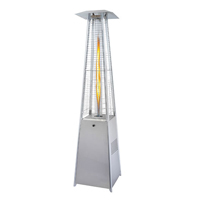 Bellagio SS Patio torch, up to 31,000 BTU's, and 4 ft flame, stands 7 ft high, safety wire guard, includes regulator, hose kit and cylinder belt. Optional Natural Gas conversion kit available. Up to 60,000 BTU's, all stainless steel burner chassis, stainless steel handles to lift chassis, electronic ignition, hammertone pewter color powder coated over pre-plated rust resistant material surround, topaz CRYSTALINE ember bed, access door in surround with stainless steel piano hinge, comes with stainless steel burner cover, available in propane, natural gas conversion kit included, 5 year limited warranty. 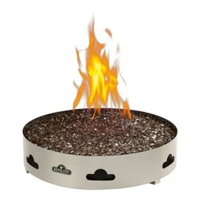 SS burner and base, exclusive GLO-CAST logs, lava rock, adjustable heat output, natural gas model includes flexible hose connector and shut off valve, propane model includes 60" hose, regulator and tank brackets. Up to 60,000 BTU's. 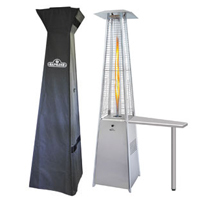 SS burner and base, topaz glass ember bed, adjustable heat output, natural gas model includes flexible hose connector and shut off valve, propane model includes 60" hose, regulator and tank brackets. Up to 60,000 BTU's. 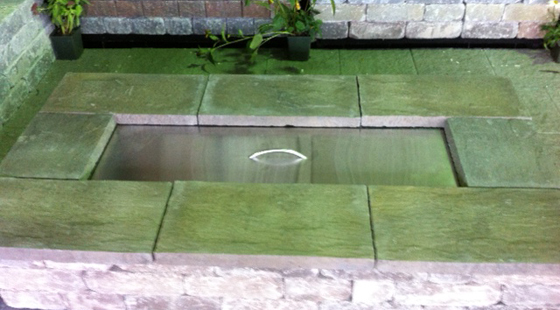 Granite table top is sold separately and requires table base. River Rocks: 1 Package needed to convert the unit from the log or glass set to the River Rocks. 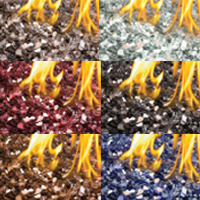 Glass Embers: 3 Media Kits (15 lbs) suggested to convert the unit from a log patio flame to the glass patio flame or to change glass colour - same amount required for either round or linear. 1. I want a "real" brick fireplace, but I don't want to have to find (and pay) a fireplace expert. The Calore2G is a real masonry fireplace that is finished with real firebricks - it looks just like a hand made (one-brick-at-a-time) fireplace. 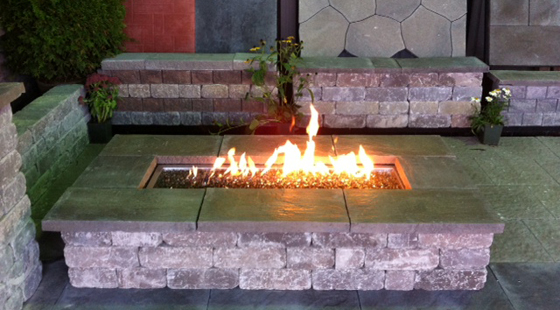 But because it is an easy to use kit, it can be assembled by any building professional, or even by a homeowners, in a fraction of the time and cost of a "from scratch" fireplace. 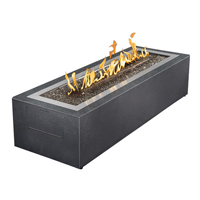 In addition to saving time and money, the Calore2G fireplace kit lets you focus your energy (and budget) on your fireplace enclosure and your outdoor living space. 2. I saw a metal firebox online, but they don't look very realistic. I like real firebricks. Exactly. 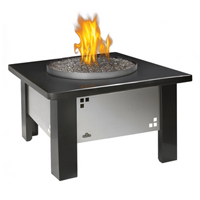 There are number of metal firebox kits out there, but you don't have to look very close to see that they are not real. The firebox is lined with fake brick panels, where the outline of the "bricks" at etched in flat panels. 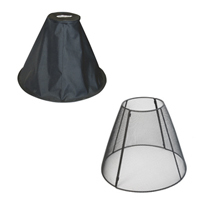 Typically, these kits has gaps between the panels, and metal edges at the ends of the panels. 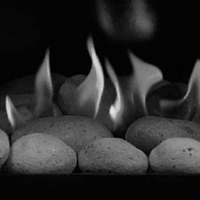 The Calore2G masonry fireplace kit is finished with real firebricks, and it can be virtually impossible to tell the different between our fireplace and a custom, site-built fireplace. 3. I want to be sure that my fireplace will last - even though it is outside in the rain and snow. That is a good point. 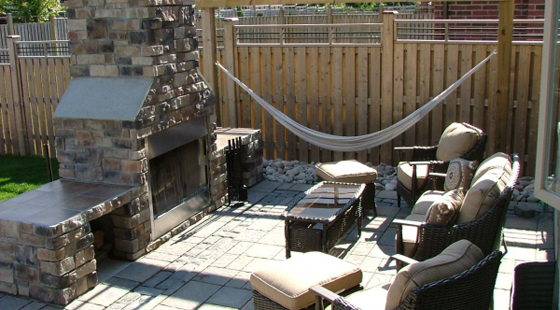 Unlike an indoor fireplace that is kept warm and dry, your outdoor fireplace will be outside 365-days per year, including months of winter rain and snow. The Calore2G fireplace kit is solid refractory (a solid, refractory composite heat resistent to 2600°F) and firebrick, and it will never rust or wear out. 4. I have heard that some site built fireplaces draw well and some don't. Is this something I should worry about? Inconsistency is a problem with brick-at-a-time fireplaces - where each one is different, and some work better than others. The advantage of the Calore2G fireplace kits is that each one works that same and that each fireplace draws really well. 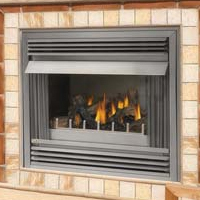 The Calore2G design features an angled back wall that reflects heat from the firebox into your outdoor living space, a smoke ledge that stops air movement down from the chimney into the firebox, and an angled fireplace throat the promotes the upward draw of hot air from the firebox through the chimney. 5. Budget is an important issue; I want to find a good deal. We feel the same way. That is why the Calore2G fireplace kit costs significantly less than other modular kits, and they are significantly less expensive than a one-at-a-time brick fireplace. 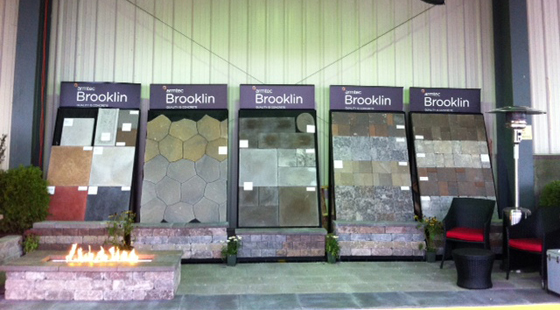 Our mission has always been to make the highest quality brick ovens and fireplaces more affordable. 6. I don't want to shop around for all the installation accessories. I want it to be simple. The Calore2G comes with a complete refractory chimney, and we can provide you with the high temperature, waterproof mortar and firebricks that you need to finish your oven - all from one place. 7. I want to use a herring bone pattern in the back of my fireplace - but I don't think full size firebrick splits (9"x4.5"x1.25") look good in that pattern. We agree. 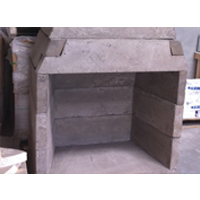 Traditionally, the back of the firebox is constructed using a full-size firebrick set on their sides, so that the narrow 9"x2.5" edge shows inside the fireplace. That is why Forno Bravo sells 9"x2.5"x1.25" firebrick splits to finish the back for the firebox, and 9"x4.5"x1.25" firebrick splits on the bottom of the firebox. 8a. I want a really big fireplace. Can you help me? 8b. I want a small fireplace. Can you help me? Yes! 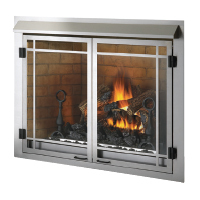 The Calore2G Series is available in four sizes, from a reasonable 30" opening to a large 48" opening. If you want to make your fireplace look even bigger, you can raise it on a concrete hearth using standard concrete blocks (CMU), and you can make your fireplace wider using either concrete blocks or metal studs and hardibacker. 9. Can I apply finish directly to the outside of the Calore2G fireplace? Yes. If you are using stucco, you should either attach stucco lathe or a stucco bonding agent to the outside of the Calore2G fireplace. 10. I am pretty handy. Can I install the Calore2G myself? That's exactly what these fireplace kits are designed for! 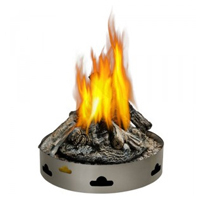 Copyright © 2019 Outdoor Fireplace Kits. All rights reserved. Website Designed & Developed by NetGain™.